Cooking barbecue, or grilling has become a year round activity, according to HPBA more than 56% of Americans say they are cooking outdoors year round. So it’s important to follow food safety guidelines to prevent harmful bacteria from multiplying and causing food borne illness. Use these simple guidelines from the USDA for cooking food safely. 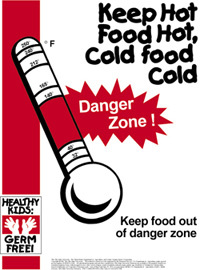 When shopping, buy cold food like meat and poultry last, just before your ready to checkout. Separate meat and poultry from other food in your shopping cart. To prevent cross-contamination (this can happen when raw meat or poultry juices drip on other food), put packages of raw meat and poultry into plastic bags. Load meat and poultry into the coolest part of your vehicle, and take your groceries straight home. If your drive is more than 30-minutes away, bring a cooler with ice and place perishable food in it for the trip. First, know your equipment, each and every smoker is different; there are hot and cold spots inside the smoker. The larger the smoker, the more hot and cold spots there will be. Weather is a big factor during smoking, the pit will smoke differently in high and low humidity. Wind and temperature will also affect smoking. On a cold day, you will end up using more fuel than a hot day. On a windy day you will need to limit your airflow or your pit will most likely run hot (remember: more air = more heat, less air = less heat). Fresh ingredients, and proper food handling guidelines are a must. Smoked meats are exposed to bacteria more so than any other cooking process. If you have questions regarding proper food handling, check the article here. It is imperative that proper food handling practices be followed. I only use real Hardwood Lump Charcoal. This can be a little hard to find depending on where you are. If lump charcoal is difficult to find then regular briquette can be used, just make sure it is made out of hardwood, without lighter fluid. In my large offset pit, I use lump charcoal to heat it up, and wood for cooking. 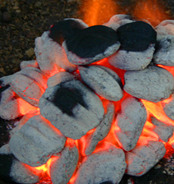 In most pits you will need to use mostly charcoal, and then use some wood chunks or chips for flavor. A good rule of thumb is 95% charcoal to 5% dry wood chunks. If you are using wood chunks or chips that have been soaked in water do not add them until you are ready to cook. Also, you will only need a couple of wood chunks if you are soaking them first, or a small handful of wood chips. To light the fire I use a fire starter stick. I have also used a gel fire starter, I never use lighter fluid, and it has a tendency to flavor the meat. When using the gel I put my charcoal in and leave about a 3 to 5 inch gully in the middle where I put the gel fire starter. If you use the stick fire starter, then place pieces of the stick into the sides of the charcoal pile. Make sure you can see the edge of the stick so you can light it! At this point you need full airflow through your smoker. Both chimney vent, and the firebox air vents should be wide open. Then light the gel or stick and close the lid/door, within 15 minutes (small cookers) and up to 60 minutes (large cookers) you should be ready to cook. On most smokers the ideal cooking temperature will be between 220 – 250 degrees. If it’s a windy day keep your air vents near closed. Remember more air, increased temperature. On some of the water smokers, you may even close the air vent completely. Typically there is more than enough air coming from the bottom and sides of the smoker. In an offset air leakage into the cooking chamber through the doors can give a convection type effect. Increasing the air draw from the firebox. In controlling your fire, there is no substitute to knowing how to control airflow in your smoker. Another method is becoming increasingly popular to increase burn times and to bring Cialis the Buy Cialis cooker up to temp slower and more accurately. This method is now popularly known as “The Minion Method”, so named after Jim Minion a competition cook who perfected this method on his WSM (Weber Smokey Mountain). This method starts with stacking a large quantity of un-lit charcoal in your cooker, then using chimney starter burn a relatively small amount of charcoal, then adding it on top of the pile of un-lit charcoal. The remaining charcoal will start and burn slowly throughout the cook. It will take many hours to burn through your charcoal this way. 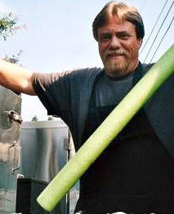 This method is extremely useful if using forced draft temp control, such as the BBQ Guru. The BBQ Guru will bring the cooker up to temp, and only burn what it needs throughout the cook. A new BBQ pit should be seasoned like a new iron skillet. It is suggested by most manufacturers to rub the inside of the pit with a vegetable cooking oil, but actually some even use lard. Then light the pit and bring the cooking chamber up to about 220 degrees. Cut the airflow in the pit to about 1/2 and let it smoke. A few hours is good, the longer the better. Another good idea is to spray or rub the oil at the joints of where the firebox meets the cooking chamber. This will help you keep the paint in those spots. Here are a few quick guidelines on cooking times. Cooking times will be relative to the temperature you are cooking at, the physical size of the piece of meat, air flow (convection effect) through the cooker, etc. This is only a guide, start with these and adjust based on your cooker. Pork ribs – a good starting point is 60 minutes per pound. 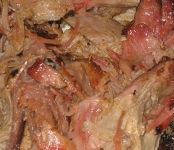 Pork shoulder – a good starting point is 75 to 80 minutes per pound, with the second half of the cooking time wrapped in foil. Chicken – 45 to 60 minutes per pound. 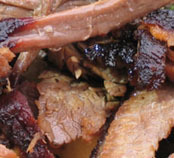 Decreased Cooking Time – Using foil on fibrous cuts such as pork shoulder, or beef brisket will aid in collagen breakdown resulting in less cooking time. Limit Smoke Absorption – Smoke should be viewed as a spice. You want to achieve the right amount of smoke flavor. Wrapping your meat half way or 3/4 of the way through cooking will limit the amount of time the meat is exposed to smoke. Some view this as a crutch, and others (including myself) view it as a very necessary part of the cooking process. The use of a water pan in upright water smokers, and in some offsets has been thought to add moisture to the air surrounding the meat. In the old smoke house days when meats were smoked for days at low temperatures, this was definitely a possibility. The reality is that at temperatures of 220+ degrees, the air will not hold the moisture. The water will actually end up on your meat, and can result in ash and soot sticking to the surface of the meat. Water used in smokers is to aid in temperature control of the cooking chamber. Many have started using sand in place of water, which will actually help in the fuel efficiency of your smoker. Keep in mind that it is very easy to burn up a piece of meat using sand in place of water, and you should know your smoker before you try this. Decisions on smoking woods used are usually based on regional availability and preference. In fact, there are more woods used then what I have listed. As I come across more I will add them. Hickory – Said to be the King of Smoking woods. I would have to agree. Hickory produces a strong sweet hearty taste. Hickory, in my opinion was made for pork. However, it works well with chicken and beef also. Pecan– Being in the same family as hickory, pecan has a similar flavor but not quite as strong as hickory. It is great on all meats. Apple – While Apple is an excellent Wood for smoking red meat; it does an exceptional job on poultry. I like to use Apple on chicken and turkey with a little bit of cherry. Cherry – Can be a difficult wood to come by, Cherry produces a delicately sweet flavor. Great for poultry, beef, fish and pork. Mesquite – Great tasting but strong. This uniquely flavored wood is as potent as it is tasty. Mesquite is actually used more for direct cooking than smoking. Be careful, too much or too long can produce a bitter flavor. Oak – Most versatile of the hardwoods blending well with most meat. Oak is a milder smoke than hickory, works well with pork, chicken, or beef. Maple – Produces a light sweet taste recommended for poultry and ham. Alder – Native to the Pacific Northwest, alder is a mild sweet wood. Great for almost all meats, used mostly for smoking fish (salmon in particular). Peach – Another sweet wood, good to use with other woods such as – Another sweet wood, good to use with other woods such as Buy Cialis oak Buy Cialis or hickory. Works well mixed with Alder when cooking salmon. Plum – Similar to Peach, but make sure to use only the fruit bearing varieties. Pear – Slightly sweet, woodsy flavor. Good with pork and chicken. 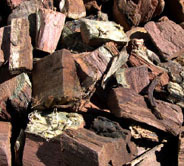 Walnut – A very heavy smoke, best when used with milder woods. Good with beef. Almond – A nutty and sweet flavor, and fairly mild. Good with most meat. Acacia – From the same family as mesquite, but a bit milder. Good with most meat. Grapevines – Becoming increasingly popular in California, does well on fish and poultry. Citrus – Becoming increasingly popular especially in Florida, is the use of the wood from Orange trees, Grapefruit trees, and Lemon trees. Citrus wood imparts a mild fruity smoke, which works pretty well on almost all meats. Australian Pine – The folks in South Florida are starting to use a wood called the Australian Pine. This tree is not from the Pine family but gets its name more so from its needle like leaves. I believe this tree is taking over South Florida and they are finding whatever use they can for it. However, its been reported to me to be a decent smoking wood. Could this be the next mesquite? I don’t know, but I will wait to hear more before trying myself. Onion Skins and Garlic Skins – I have never tried this myself, but I was told to wrap in foil and let smolder rather than direct contact with the flame. Herbs – Makes sense to use aromatics such as Rosemary, Thyme, and Basil. Make sure to soak them first. There are different ways to cook, and determine doneness in your BBQ ribs, and we are going to break those down into the 2 types. 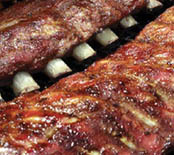 St Louis Spare Ribs – St Louis Spare Ribs can be one of the most difficult meats to cook and to get done accurately. Many of the ways you would determine doneness, take some time and experience to identify and master. But first, we will cover a good process to use, which will take you real close to being done, and then you can apply a couple of simple techniques to determine doneness.